On 11 September of this year Harry van Kuyk (1929-2008) White on white. And black. Relief prints and artist’s books will be presented. The final phase of the layout, in the hands of studio frederik de wal, is in full swing. The book is to be printed by NPN Drukkers in Breda in August. The book presentation takes place at the Museum Het Valkhof, Nijmegen, on Sunday 11 September, at 2.00 p.m. The programme will follow. Simultaneously there is a selection of Harry van Kuyk’s relief prints from the museum collection on display in the Museum Het Valkhof print gallery from 11 June until 2 October. After the book presentation in Nijmegen a second presentation may take place in the Museum Meermanno / House of the Book in The Hague in the autumn of this year. Further information will follow. 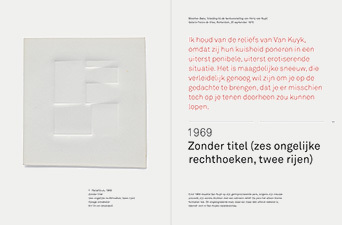 In Meermanno the focus will be on the typographic aspect of Van Kuyk’s work and artist’s books. White on white. And black: ca. 400 pp., ca 250 ill., price € 49.95 (shipping not included). On sale from 11 September, after the book presentation. After that date from Van Kuyk Publishers (Marie-Antoinette), Ooij.